Our families usually had the national news on tv while we ate supper, so we had vague memories of the Bosnian war and of Sarajevo. Explosions, buildings on fire, wounded people being carried through the streets. But we were in middle school and high school when it all started, and the evidence of war that still remained on the drive between the airport and the city center reminded us of how much we didn’t know. So if you’re like us and need some background information, here is a crash course in what happened in Sarajevo two decades ago. Yugoslavia was a country that unified six ethnic republics in the Balkan region. Following the death of leader Marshal Tito in 1980, many of the republics tried to become more autonomous, but Serbia, which had held most of the political power, wanted stronger federal control. The situation deteriorated and Yugoslavia began to break apart. In 1992, Bosnia declared independence. The Yugoslav federal army exited Bosnia, but left its arms with the Serbs, who used them to attack Bosnian cities. The Serbs entrenched themselves in the mountains surrounding Sarajevo, which gave them the perfect vantage point to bombard the city with heavy artillery and sniper rifles for nearly four years. 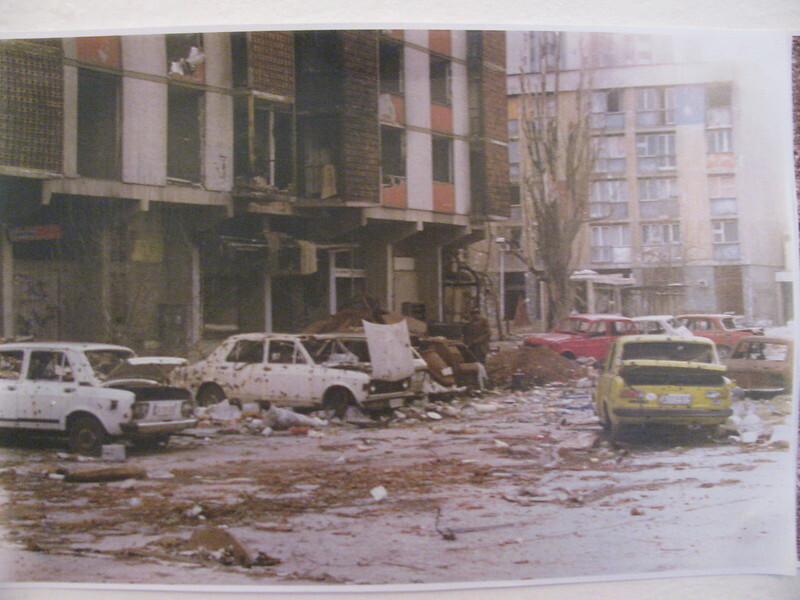 Over 10,000 adults and 1,500 children were killed, an additional 56,000 Sarajevans were wounded. In Bosnia, and over the entire breakup of Yugoslavia during the 90′s, hundreds of thousands of people were killed in acts of war and genocide, and millions of ethnic minorities across the six republics were displaced. Even though the war ended nearly 17 years ago, you can see it everywhere. 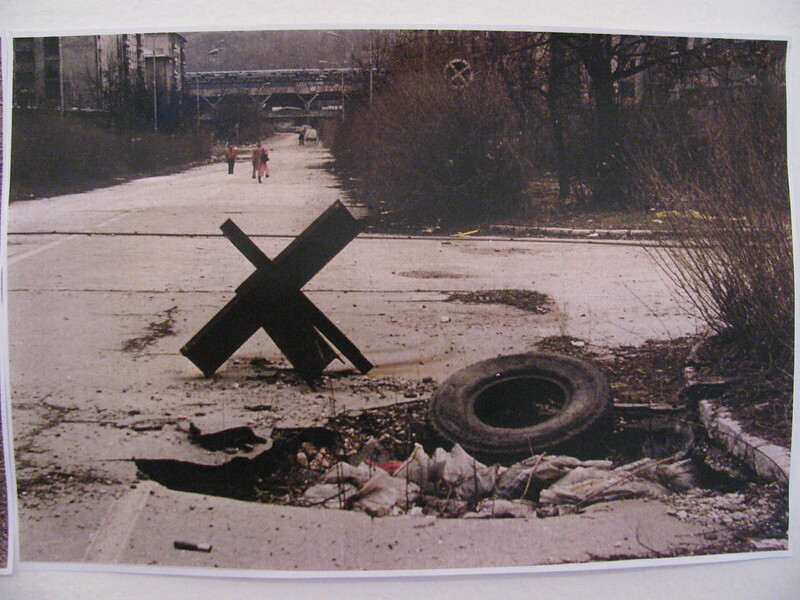 In the Sarajevo Roses – shell craters filled in with red resin where people were killed – now fading and chipped all over the city. In the damaged World War II memorial. In the evidence of reduced population and industry and an economy that never fully recovered. In the official memorial for the children who were killed. In the National Library, whose 1.5 million volumes were incinerated. In the bullet holes that speckle so many buildings, even underneath bright graffiti. One thing that particularly made an impression on us was when we visited the Tunnel Musuem. During the seige, the only way to get food and supplies in and out of the city was the UN-controlled airport. But to get between the airport and the city was practically a suicide mission due to sniper and rocket fire. A tunnel over half a mile long was dug from a civilian home, underneath a field and the runway, and 20 million tons of food passed through to keep the city fed. Jasmina, the woman owns the hostel we stayed in, was a student at the University of Sarajevo before the war broke out and was trapped in the city. Her family lived in Dubrovnik, which was also heavily attacked, and neither she nor her family had any way of contacting each other. Food was scarce and no one knew what the next day would bring, or if they would live to see it. By the time the war ended and she was able to return to Dubrovnik, her parents were no longer living. After all that, you might think that our visit to Sarajevo was extremely depressing. But it wasn’t. We’ll post more later.